At Fully Lined Church Suits, our belief is that a church suit ensemble deserves a little something extra and special when dressing for church. 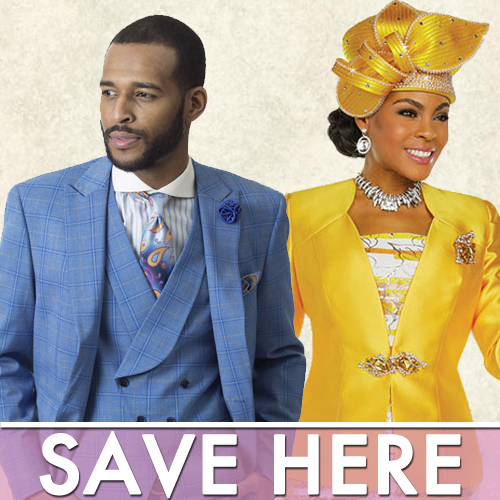 Our accessories department includes church hats, church day and evening bags, church scarves and jewelry to perfectly match any of our exclusive, church outfits. We are most proud of our church jewelry department. Our design experts source the latest church design from leading resources, including those in Paris, London, Milan, Berlin and around the rest of the world. Also, please spend enough time browsing our proprietary, one-of-a-king church hat department. Here you will find exclusive, custom made designer hats of all of your special ocassions throughout the year. And, all our church hats are assembled in the United States. Enjoy Shopping!